Bell Kilgour Gold Mining Limited . This is the spot overlooking the present Kawarau River where, during the depression of the 1930s, William Kilgour and Percy Bell both of Cromwell in their early 20’s discovered a buried channel of the glacier feed Kawarau river which had riches beyond belief. After tunnelling thru solid sandstone on the edge of the present river for some 180 feet broke thru into an ancient river bed some 50 odd feet below the present flat . This ancient river bed was laid down many millions of years ago in between several ice ages when the present day mountains were developing the river and ice flows drained the rich afferrious reefs of the Shotover and Arrow rivers to the west . When this ancient river exited the gorge it cut a very different path then in the direction of the present day town of Cromwell under the present alluvial flats to the east . Over the millennium the concentrating of millions of cubic meters of gold bearing detritus flowing down the river deposited rich gold at the face of the eroding glaciers . This discovery was probably found early after Hartley and Reilly’s discovery in 1862 further down the Kawarau river, by a man known only as “Scotland” who we know tunnelled into the lead in a hole only large enough to squeeze into on his hands and knees and assisted by his wife pulled the gold gravel from the small borrow on a tray attached to an endless rope. The fable goes he recovered a mug of heavy nuggets daily and returned to Scotland a happy man. The day that Bell and Kilgour broke thru into the old river bed before their eyes and by the light of a flickering candle they saw before them the ancient river bottom studded with gold nuggets that they flicked out of the gravel face into a Riverhead Gold tobacco tin some 9 ounces of gold they decided that would do for the day and got on their bicycles and rode back to Cromwell . 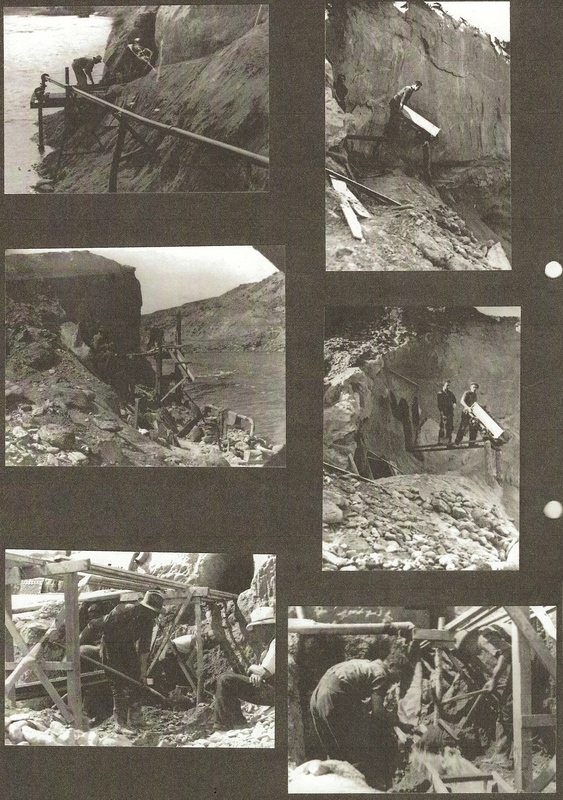 This was July 1932 this discovery was significant being the biggest find since the 1862 gold rush and it was not long before the land surrounding the discovery was pegged off by prospectors from far and wide and it sparked another gold rush . 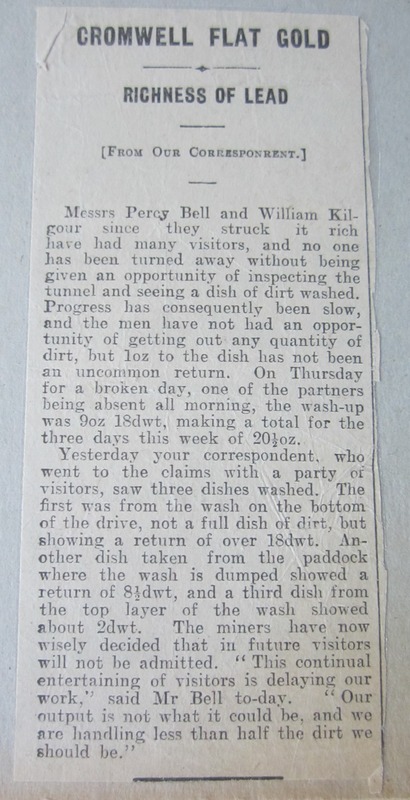 In the Bell Kilgour mine it was not unusual to select a pan full, wash and recover some 4-5 ounces of gold . You can just imagine when the company promoters got on to it investors went mad. 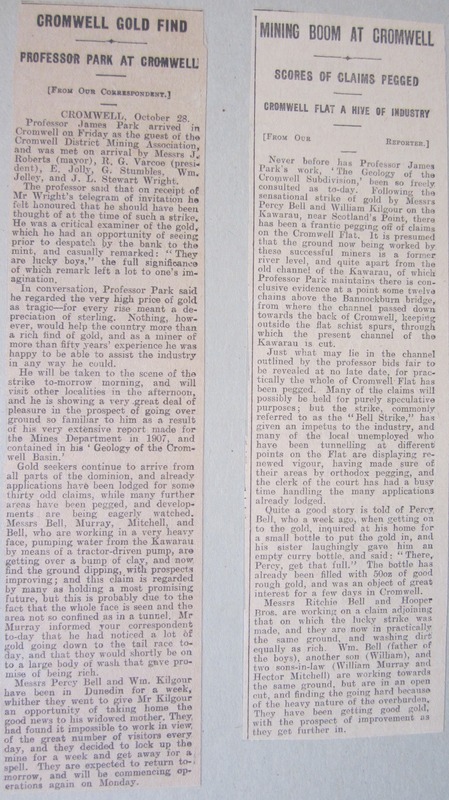 This prompted the floating of the Bell Kilgour Gold Mining Company at Scotland’s Point and a frenzy of share trading. The company had a share capital of 35000.00 pounds divided into 700000 one shilling shares and Kilgour and Bell to receive 16000.00 pounds between them if the option was taken up which subsequently it was . 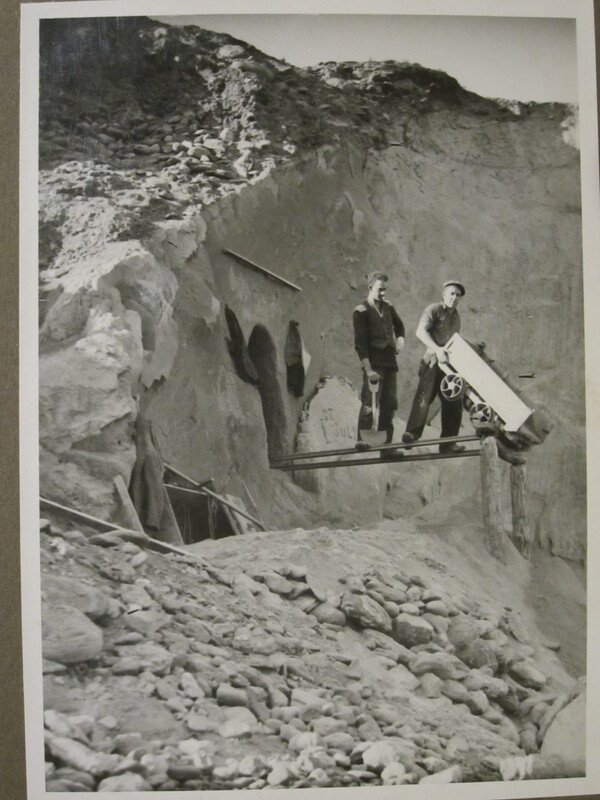 Bill Kilgour continued to invest in other mining ventures and share trading and it was not long before the fortune was severely diminished Bill died in 1975 at the age of 64 at Cromwell .